James Lindsey is product manager, SigmaTek Systems, LLC, Cincinnati, OH: 513/674-0005; www.sigmanest.com. In today’s competitive business environment, producing parts more quickly and less costly gives sheetmetal fabricators an edge. Many businesses are trying to get the most out of the machines on their shop floor by purchasing automated material-handling equipment such as sheet loaders/ unloaders, as well as investing in new machines that can rapidly cycle hits and change tools. While new equipment may increase productivity, if businesses are still programming their machines with their outdated or original OEM manufacturer’s software, they are not getting the full benefits from their machines. 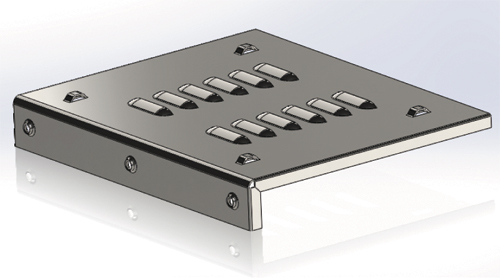 Recent advancements in software capabilities make it possible to automate the steps required to develop part designs and nests, and generate the required NC coding for plasma- and laser-cutting machines as well as CNC punch presses. This level of automation reduces manual data entry, which then reduces the required amount of manpower while increasing the accuracy of the CAD/CAM process. To fully explain how automation can be integrated into the punching process, let’s first take a look at the individual steps involved and how each step can be improved upon. A good place to start this journey is at the beginning—incoming orders. Orders typically are received and entered into the business system using manufacturing-resource-planning (MRP) software. At most companies, this begins with printing out the orders and sending them to the sheetmetal-nesting department. At this point, the programmer performing the nesting typically sorts the orders into different piles by material type and thickness, and due date. He then locates and manually imports the required CAD files, including adding the material type, thickness, quantity and due dates. This process can take several hours, depending on the number of orders being processed. Now, due to new developments in nesting software, the order-entry process can easily be automated, thanks to a database transaction that sends data from the MRP system to the nesting software. By automating this step, the nesting operator can receive the data in minutes, including updated information on any changes made to due dates or to the quantities of each part order, or to react to orders put on hold. When orders are received, the data can be linked to existing engineering data to enable automatic importing of the CAD data. Fabricators should implement standards for creating the geometry of formed features such as louvers and embosses in a 2D CAD file, to ensure the features are handled by the nesting software. However, CAD data is not als perfect. How, then, can a fabricator guarantee reliable and accurate part information? The answer: Good engineering standards. We recommend that standards be attained by requiring the engineering staff to follow a well-defined set of rules for layers and methods of creating clean and consistent drawings. Before moving on to CAD data, however, we need to first focus on inventory. Inventory records found in the MRP system must match the data in the nesting system in order to gain full advantage of the integration. Then, with the system properly set up and as material arrives at the plant and is entered into the MRP system, the inventory will automatically appear in the nesting system. As the material is consumed and remnants are created, the MRP system automatically receives those updates without manual intervention. Otherwise, the nesting system and the business system can result in a mess. Regardless of where the CAD file originates—a vendor or the internal engineering department—it is important to use good engineering practices. This may require working with the engineering department creating the CAD file to agree on and maintain good engineering practices. DXF files should follow sound drafting rules, including how title blocks, dimension and other information breaks down into layer information. 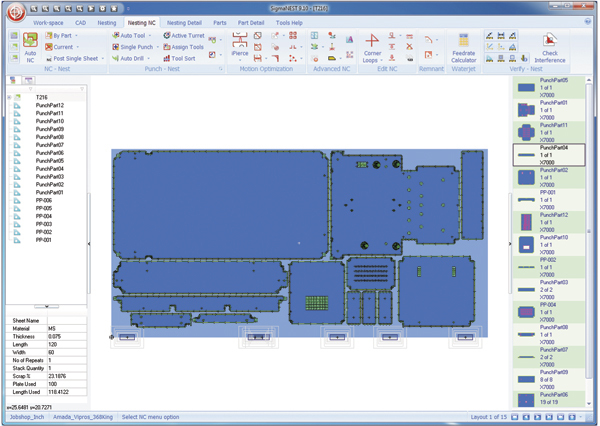 Because DXF files typically are 2D CAD files, they should include text strings to pull material type, thickness and other information from the file. In addition, fabricators should implement standards for creating the geometry of formed features such as louvers and embosses in a 2D CAD file, to ensure the features are handled by the nesting software. Often, solid models can be easier to use, since the design intent is captured inside the solid model. The importing configuration can be designed to have material type and thickness data pulled directly from the model upon import, and at the same time have certain features removed. 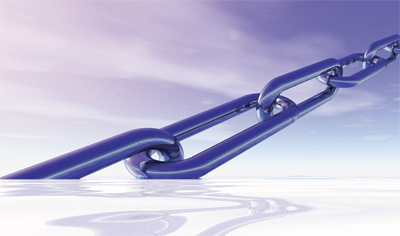 In any case, maintaining consistent engineering standards will ease the import process from any CAD system, and ultimately save the company from unnecessary duplication of effort. At this point, much of the mundane, duplicated chores have been removed from the nesting process. Now the real fun begins. One of the biggest challenges a user faces when nesting is selecting which parts to include in the nest. Nesting parts too early in relation to their due date can create problems, should the order change or get cancelled. Storage also can be a problem when making parts well in advance of the due date. Of course, nesting too late and not having the parts finished in time also creates headaches. So how can a fabricator keep part orders prioritized and on track? Drawing from a greater number of components, nesting software has a better chance to arrange parts for maximum material utilization. Filler parts, or those demanded frequently, may be able to fill the remainder of a sheet when necessary. State-of-the-art nesting software can communicate directly with the scheduling software, and label past-due parts as higher priority than those due in a week or more. Unfortunately, as many programmers know, schedules can change quickly. A last-minute job can disrupt a well-planned time-table, and even cause material waste when it forces a fabricator to rush to complete the job. For this reason, software can nest a day or more in advance. Drawing from a greater number of components, nesting software has a better chance to arrange parts for maximum material utilization. Filler parts, or those demanded frequently, may be able to fill the remainder of a sheet when necessary. A caveat: Nesting should not look too far ahead or run too many filler parts, as this could flood the shop floor with work in process. Programmers must balance maximum material utilization with downstream production needs. Getting the most out of a sheet means little if a welder must sit idle awaiting a component that was not nested because it didn’t fit neatly onto a sheet. While fitting the component onto the nest might produce a little more scrap, the cost is negligible compared with the expense of a highly skilled welder sitting idle. The traditional method for adding tooling to parts—to tool each part and save it to a library, and then recall these parts as required for nesting—presents a few disadvantages. Should a revision be created, the fabricator will have to retool. Or, the tool assigned to the part may no longer be available. Also, if multiple parts are nested with conflicting tool stations, changes must be made that will delay moving the nest to the shop floor. An ideal nesting system offers both—the traditional method and an option to tool parts quickly as they are nested. This system uses the available tools, minimizes tool setup and changes, and quickly makes nests available to the shop floor. All of this keeps those expensive punching machines running, and maximizes profitability. Toward the end of the nesting process, the programmer sends the part nest to the shop floor. What happens if the all of the parts are not included in the nest, which can be caused by a variety of issues including incorrect tool changes or a power outage? In this case, the operator must make a notation on the paperwork and request an immediate, updated nest from the programmer. With a more integrated software system, communication between programmer and machine operator becomes more effective and productive. An operator can reject a part using the software installed at the machine. Businesses also can apply rules that require the operator to state a reason for a rejection, to allow proper tracking of downtime and engineering changes. Once rejected, the information is automatically sent back to the nesting system as a high-priority part. Then a new nest can be developed and the part can be combined on a nest that contains any newer parts that require the same material type and thickness.